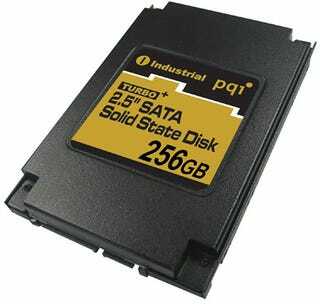 The race toward affordable solid-state notebook drives is about to goose itself into hyperdrive, but PQI is coy about the pricing of its SSD Turbo+ line of solid-state storage, starring its latest 256GB solid-state notebook drive. What's so great about that? It's a speedy Serial ATA (SATA) drive, and it's in a 2.5-inch form factor, the perfect size for just about any notebook. Oh yeah, and the main thing is that it's not a spinning, noisy, hot and power-hungry hard disk. The company also teased an upcoming 32GB ExpressCard (pictured above) that's solid state, too. Depending on its price, this could be a welcome sight for those MacBook Pro worshipers, or users of any other laptops with ExpressCard 34 slots. The company also announced 32GB 1.8-inch drive (pictured below) for industrial use only (whateverTF that means). Also along for the ride was a CompactFlash card (pictured below) with 16GB of elbow room. The company touts that CF card's high speed, reportedly giving you 38MB per second transfer rate. We'll believe it when we see it. But to hell with PQI for not telling us the price of any of these little trinkets, because anybody can make these drives for exorbitant prices. It's bringing the price down to earth that will make all the difference in the world. Give us a day or two and we'll see if we can beat the prices out of those pussies.